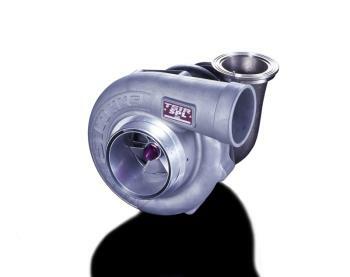 HKS Signature Turbochargers UNIVERSAL - Dezod Motorsports Inc - Home of the automotive performance enthusiast since 2002. The HKS Signature Series Turbos are Garrett based, but have re-engineered compressor and turbine wheels along with specific A/R and trim levels to maximize power output. The smallest of the HKS Signature Series Turbos is the TO4S which is rated to 550HP and the largest of the series is the HKS flagship turbo the T51R SPL which is rated to 1,000HP. The T51R class of turbos is broken up into two units, the T51R Kai and the T51R SPL which are rated to 800PS and 1,000PS respectively. Both the T51R Kai and SPL utilize a V-band flange and are available with a ball-bearing center cartridge that allows for 11% faster spool up then the standard sleeve bearing versions.